We got too many candy canes in this past holiday season. I bought some to decorate our mini Christmas tree and to make the candy sleighs for almost everyone in the family. We each got two candy canes in our stocking from Santa, this is me, hubby, 3yr girl and 1yr girl. The girls love candy cane. They probably had too much over the holiday. I am not a big fan of any candy but chocolate but I do enjoy candy cane in my hot chocolate. Oh, isn't that just meant-to-be match. To stop the craziness of overflow candy cane in this house before another flow of candy showing up on Valentine's Day, I'm on the mission of consuming these candy canes in a special way. 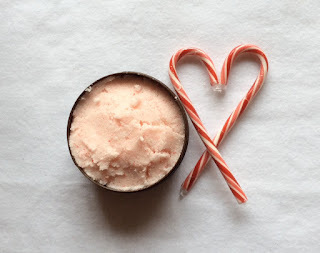 This body scrub recipe is from the blog post by MODERNMOM. I recycled my The Body Shop body butter container. It is the 200 ml 6.75 oz size. If you are familiar with TBS body butter, you know this is their normal size, meaning not mini, not jumbo. I like the sweet smell of coconut oil but it kind of covers the peppermint scent from candy cane. I added 5 drops of peppermint essential oil and get the balanced smell I want. Make this for your friends and family and let everyone you love enjoy this refreshing, sweet and delicious body scrub.